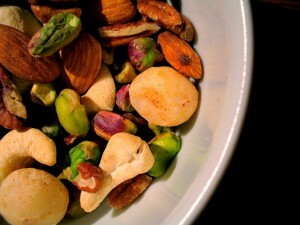 Nuts are the perfect healthy grab and go snack! Packed with protein, fiber, and unsaturated fats, nuts can boost your energy level and stave off hunger during this busy holiday season. Almonds are the lowest-calorie nut and packed full of magnesium, which helps regulate and lower blood pressure. More importantly, the antioxidant nutrients in nuts lower the risk of chronic oxidative stress and inflammation, helping to prevent the development of many types of cancer. Plus, the zinc found in the pumpkin seeds that add interest to this particular recipe helps aid immune support, cell growth, and improve overall mood. Choose nuts and you won’t regret it! 2. Scatter all the ingredients except for the pepper and cayenne in a roasting tray. 3. Roast for 15-17 minutes, stirring occasionally, until the nuts turn dark brown. 4. Remove, stir in the pepper and cayenne, and taste. Add salt if you like. 5. Leave to cool in the tray, stirring from time to time. Once cool, transfer to an air tight container. Double or triple the quantities and play with the flavors; you’ll easily get hooked on this healthy snack!